Throughout winter in Japan the term “Sea Effect Snow” is repeated over and over again when discussing the winter weather and incredibly high snow totals that dominate snow country of northern Japan. In this episode of westpacwx 101 we will break down what sea effect snow is what causes it. Now despite its name sea effect snow is NOT salty. As we all know when water evaporates from the ocean it leaves any salt behind. It gets its name from the Sea of Japan, much like Lake effect snow in North America. Throughout winter we often see winds start to blow in from the north west out of Siberia carrying with it cold dry air over the relatively warm waters of the sea of Japan. Specifically the Thushima current which runs through this region. Check out our video on ocean currents to learn more about this. When the air is below freezing and there is a difference of at least 13C between the Siberian air mass and the water you may start to see some clouds forming up on satellite imagery indicating sea effect snow is starting to form. 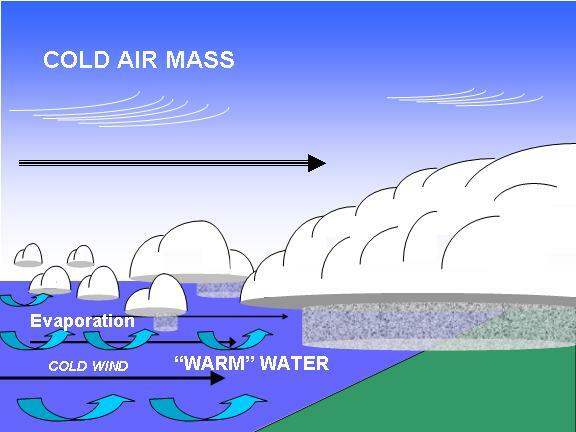 A few other factors need to be in place including little directional wind shear meaning all the winds in the lower atmosphere need to be heading in the same direction which is typically from the north west embedded within a deep artic air mass. Now what makes Japan so special is that you have the sea effect snow but at the same time upslode or orgraphic lifting comes in to play. When this type of lifting occurs the land or mountains in this case forces the air to move to a higher elevation. Several thermodynamic variables change when air rises. The temperature of the air cools as air is lifted. Thus more air becomes saturated and more snowfall occurs. That is why if you are a skier Japan is considered some of the best powder in the world. For people in Tokyo though you would never realize so much snow is falling to the west unless you went there or heard about it. That is because the same mountains that squeeze out all the moisture also stop it from going east. So when Nagano or Niigata are seeing very heavy snowfall Tokyo will likely be seeing sunny skies. You need a southern coast low or a low that avoids the mountains to bring snowfall to Tokyo. Thing is those come as the name suggest from the south, that means they are often to warm. Learn more about these storms at the video link. Finally there is one more phenomena to talk about. Specifically in Hokuriku where some of the heaviest snowfall takes place. And to an extent, people here have north Korea to thank. Reason is often when winds are just right out of the north west a mountain chain here splits the wind and then it rejoins downwind creating one large wind flow of sea effect snow. Furthermore Hokuriku is the farthest area away from landmasses on the other side of the sea of Japan. That means more water which means more of a moisture source for the snow to be picked up. So if you like snow, this the place to be all winter. If you are not a fan. Do not head to northern Japan.